Shimmerene is a town located on the eastern shore of Summerset. 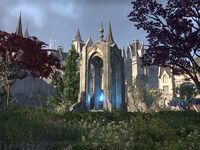 Known also as the City of Lights, the town is in turmoil, as Queen Ayrenn's decree allowing outsiders to come to the island has divided the public opinion of its citizens. Shimmerene Objective: Find Lanarie's missing son, Arathel. The Shimmerene Wayshrine is located just outside of the city's main entrance. This location previously appeared in Arena as Shimmerene. The author Aicantar of Shimmerene hails from the city. A drink known as Shimmerene Tonic is also named after the city. 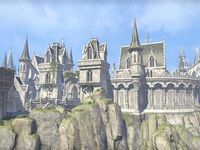 Some structures of the city can be seen from Auridon. This page was last modified on 9 February 2019, at 07:16.